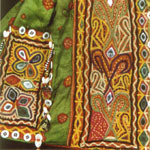 The folk textiles were generally always made by women, and were produced for their own family’s use. These textiles were not originally intended to be bought and sold, and are often classified as rural textiles. Embroidery was the most widely used techniques for the domestic and home textiles, but we also find many woven and painted pieces.